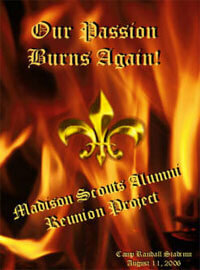 From a Madison Scouts Alumni Reunion Corps press release: The Madison Scouts Alumni Reunion Corps, a 240-member drum and bugle corps assembled specifically for the 2006 season to perform at the Drum Corps International World Championships on Friday, August 11, has added one more appearance. The added event will be held on Wednesday, Aug. 9, at Memorial High School's Mansfield Stadium in Madison, Wis., at the intersection of Gammon Road and Mineral Point Road on the far west side of town. Four groups will be featured including Capital Sound, the Madison Scouts, Jubal from the Netherlands, and the Madison Scouts Alumni Reunion Corps. Food will be available for two hours prior to the gates opening at 7 p.m. The first corps will step off promptly at 8 p.m. General admission tickets are $10 for adults and $20 for a family (two adults, up to four children under age 12). Fans should be prepared to pay cash only. "The Voice of DCI," Brandt Crocker, will be the evening's announcer. Following the alumni corps performance, the Madison Scouts, the Madison Scouts Alumni Reunion Corps and any other alumni in attendance, will gather at the front of the field to sing "You'll Never Walk Alone," the organization's theme song. More than 400 voices are expected to participate. Among a large honor guard will be an original member of the corps, Richard Goldberg, who recently celebrated his 80th birthday. His son, Robin, still lives in Madison and was a member of the corps from 1973 to 1976. Father and son will be joined by a number of other father/son teams and at least one set of twins who marched together in the corps, Boyd and Bart Garey. To conclude the evening, Madison Scouts Alumni Reunion Corps Director Randy Ferrie will present a check representing the profit from the show to the Madison Scouts' Executive Director Sal Salas. Nearly every one of the corps' 68 seasons up to this year is represented in the alumni corps.